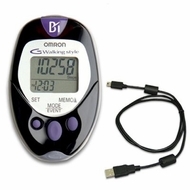 Omron's HJ-720ITC Pocket Pedometer helps you walk the path to better health. The pedometer measures steps, aerobic steps (10 minutes or more of continuous movement), calories and distance. The Omron Health Management Software helps you Monitor you progress as you achieve a healthier, more active lifestyle by tracking days, weeks, months and years of exercise. Just connect the pedometer with its USB connection to your PC to begin tracking your health today. Physical activity is essential for good health - Omron's HJ-720ITC Pocket Pedometer helps you improve overall health, lose weight and get more energy in your daily life. Unique dual sensor technology, for carrying the pedometer in your pocket or bag.